It’s been six months since we visited the island of Mauritius so it’s about time I shared our hotel experience! The memories are far from fresh in my mind, thank god for photos or I probably would have forgotten it. We searched online for hotels after being told a ridiculous price from a travel agents. After a week or so, we decided we’d prefer a quieter hotel on a half board basis and found a gorgeous little family & friends run hotel, Tropical Attitude. 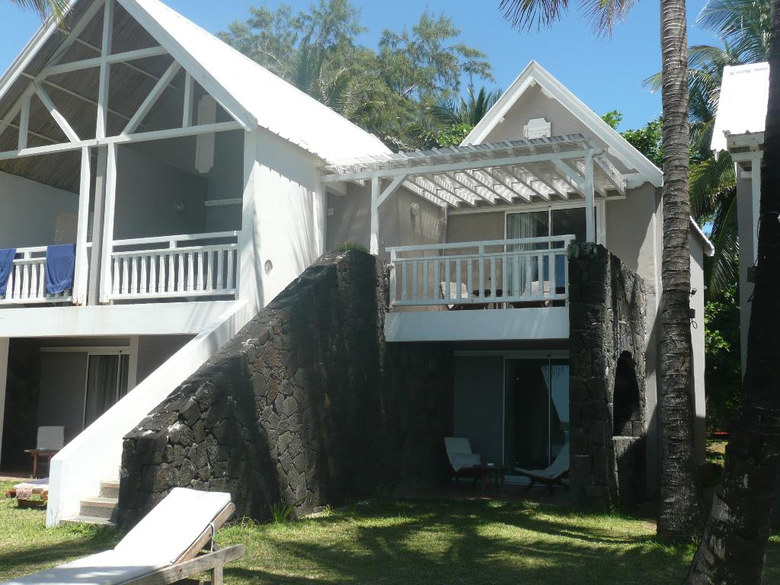 Tropical Attitude is situated in the East of Mauritius in Trou D’eau Douce in the District of Flacq.  About 50 minutes from Sir Seewoosagur Ramgoolam International Airport (what a mouthful!). 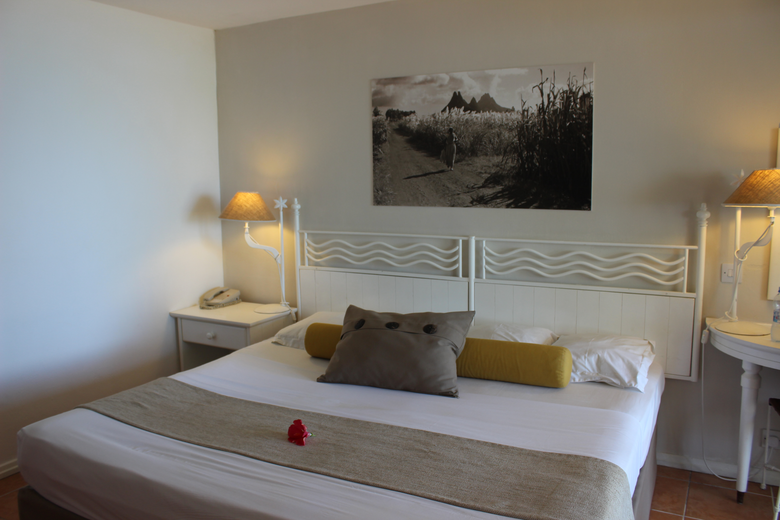 Trou D’eau Douce is an area located next to the ocean and surrounded by fruit fields and fishing villages. 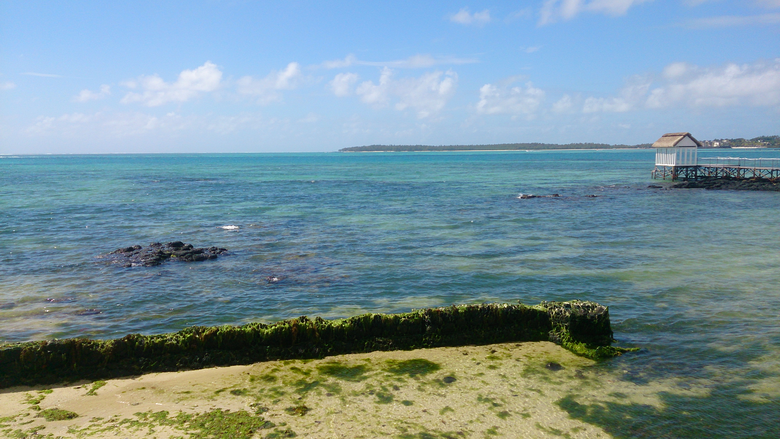 There is also a boat pick up point for tourists wanting to visit the adventure packed island of Ile Aux Cerfs. The East coast is far quieter than the North and West. We didn’t want a big resort, more a laid back retreat where we could come and go as we pleased. 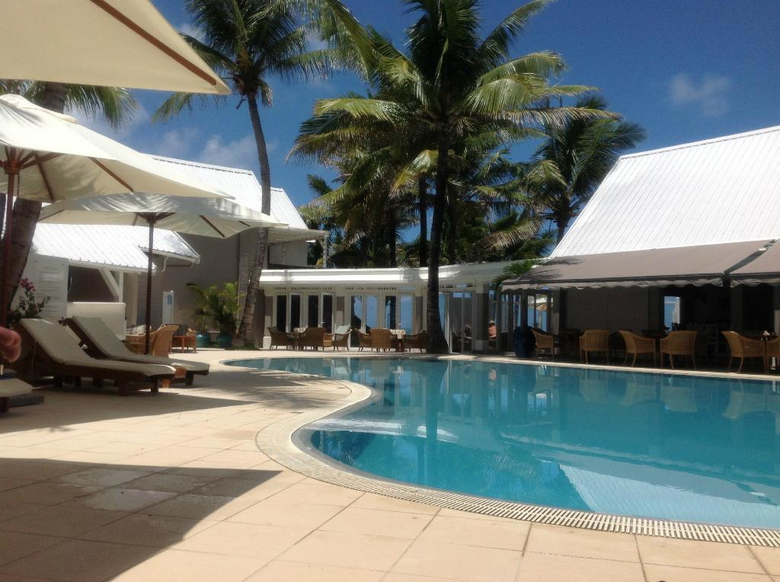 Tropical Attitude is a 3* sup hotel with 60 rooms set across two storey traditional Mauritian style bungalows. With 58 couple superior rooms facing an ocean view and 2 family rooms with a garden view. 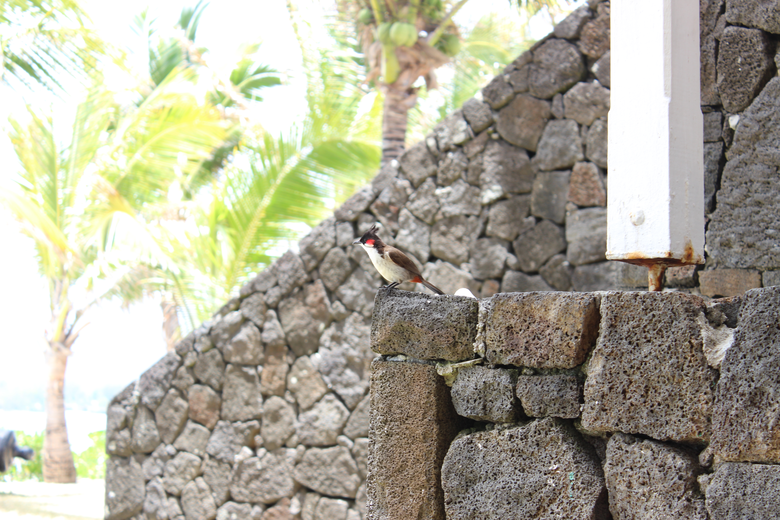 The hotel is mainly an adult hotel, we saw no children over our 2 week stay – bliss! Our room was set on the ground floor, making me very happy- just look at the view! A gorgeous sea view for every room! 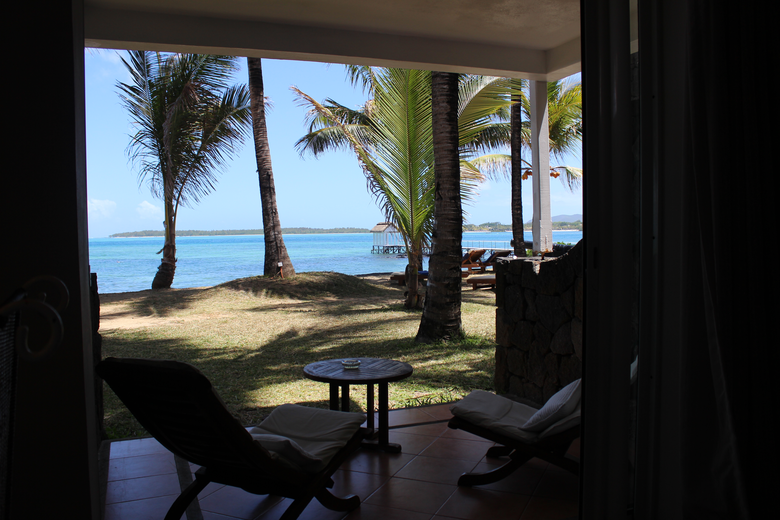 Every morning I woke up, opened the doors and sat out on the sunbed watching the ocean. Extremely therapeutic! The rooms are light and airy with standard room features: a superior king size bed, large wardrobe space, dressing table, flat screen TV with local channels, air-conditioning, minibar, tea and coffee facilities, en-suite bathroom with shower cubicle. Tropical Attitude has a swimming pool, restaurant with bar area including evening entertainment, Wi-fi, gift shop and spa. 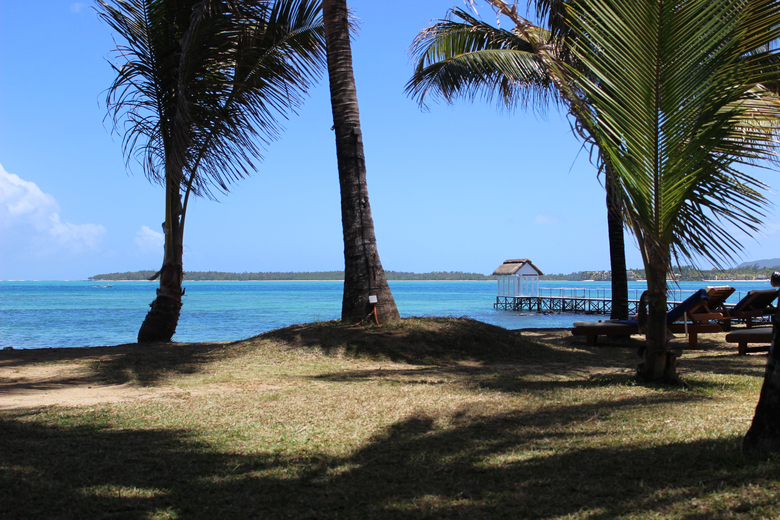 The watersports outpost has snorkelling, a glass bottom boat and free boat trips to Ile Aux Cerfs. Extra services include laundry and room service. 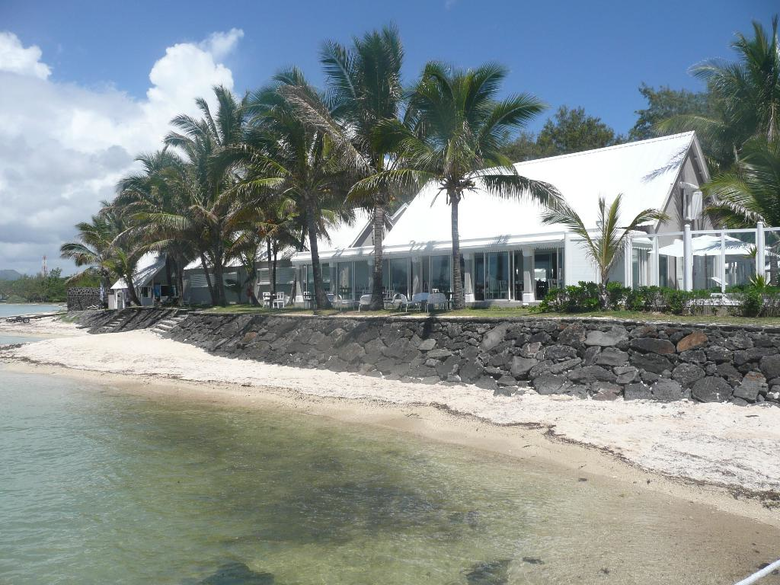 The restaurant serves a buffet breakfast, a la carte lunch and packed lunch for day trips to Ile Aux Cerfs. The buffet has set menu for dinner depending on the day. Breakfast for me consisted of hot crepes with Mauritius cinnamon sucre, chicken sausages and plenty of fresh fruit such as watermelon, bananas a lychees. On the evenings that we relaxed in the hotel we would have the buffet. With a different theme every night, the Chinese and creole were my favourite because of the noodles and vegetables. The chefs were also more than happy to prepare dishes to our taste. 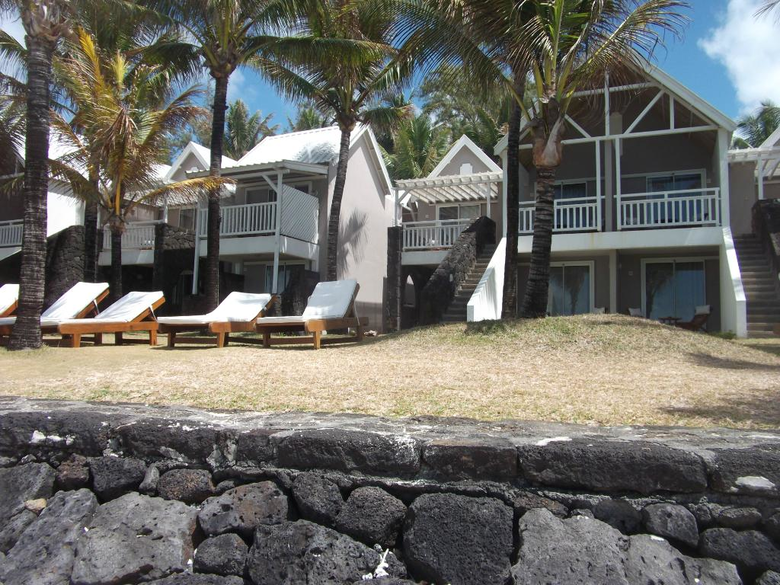 Tropical Attitude in Mauritius has a perfect laid back atmosphere. The staff were always friendly and went out of their way to assist us at any point we needed it. 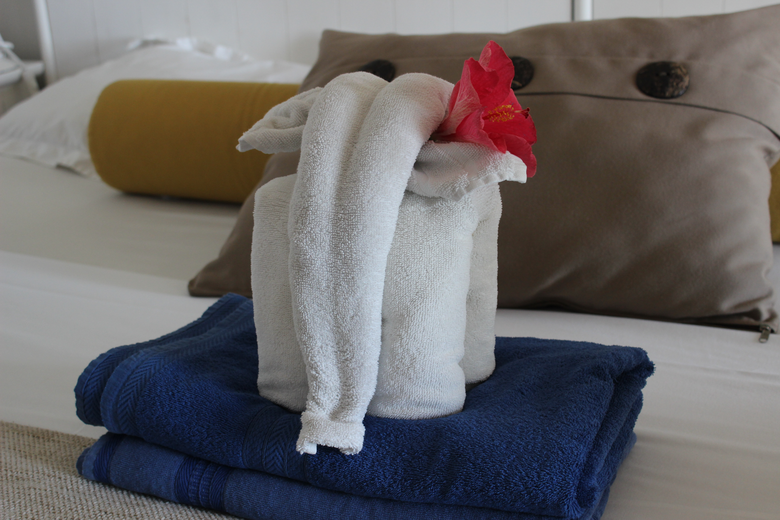 If you’re looking to stay in a quiet and secluded, adult style hotel then definitely consider Tropical Attitude. Have you visited Mauritius or would you? If not, tell me about your favourite holiday! Just. Uh! This looks like paradise!!! Such beautiful photos! What camera do you use? This just makes me want to go on holiday now! 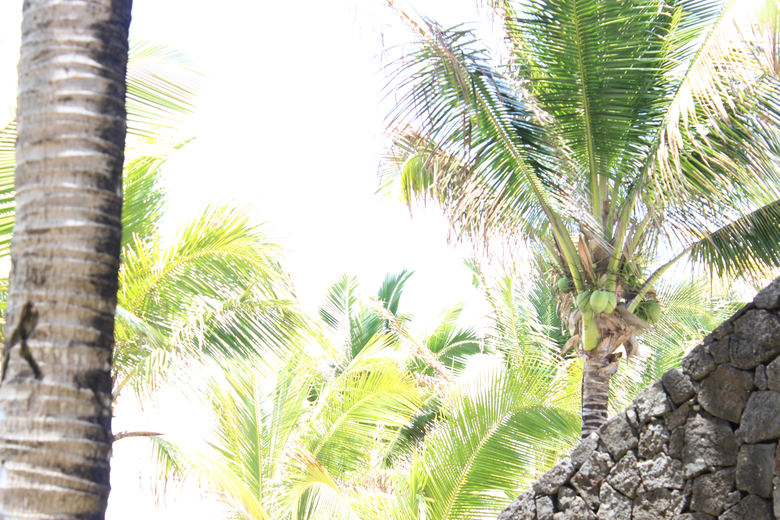 I love Mauritius. I went with my family so we were in a big resort, but waking up with the ocean sound was magical! It might be time for me to book a holiday soon! Wow, gorgeous photos! Made me feel so summery! Wow this looks so beautiful!! That view to wake up to looks amazing. Sounds like bliss.